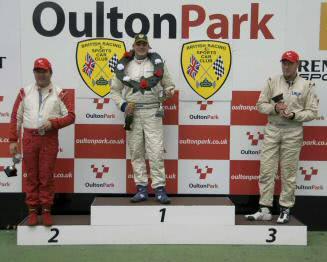 Figes won a four car battle for third, from Paul Fleury, Rob Vissers and Dean Wilkin. Both Figes and Vissers shot by on lap four and chased down the leader Fiorentino whose advantage was down to 0.203s by the end of lap eight. Figes had the scent of victory as the chequered flag was readied. I saw Raphael take the defensive line and went wide at Old Hall. I got the run on him into Cascades and came out in front. I waited until the end, challenged Jonnie at Old Hall and grabbed the place, said Broad. At the finish Walker was 0.06s adrift, with Johnson and Halcrow holding station behind. The whole field started to spread out by the end of lap 10, and Broad looked set for a considerably easier second win. However Walker almost pipped Broad at the post. I had a problem with fourth gear, changing down from fifth. So I stayed in fourth but it took me half the race to decide, said Walker. The gap closed dramatically on the last lap, but Broad held on by just 0.032 seconds.